SAVE UP TO 50% OFF! POP A BALLOON SALE ON NOW! Shop Bennett's Furniture and Mattresses for the best sales and deals on furniture in the Peterborough, Campbellford, Durham, Lindsay, Haliburton, Bancroft, and Kawartha Lakes area. 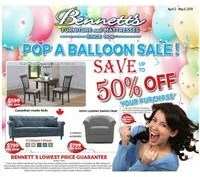 Sign Up for Bennett’s VIP Club to be informed of upcoming sales and discounts…and much more.